Wai Ora Lakeside Spa Resort in Rotorua proudly uses the "Alite" Spa product range designed to utilize the unique properties of Rotorua’s mineral-enriched mud. Geothermal mud from Hells Gate Geothermal Reserve has been combined with some of New Zealand’s finest natural ingredients including Manuka oil (Tea Tree Oil) and Manuka honey to develop a comprehensive skin care regime. Rotorua’s unique geothermal mud is renowned for its healing and invigorating properties. This mineral-enriched mud provides an excellent source of silica, alumina, magnesium, calcium, iron, titanium, sulphur, phosphorous, sodium and potassium as well as trace elements such as copper, zinc, selenium, cobalt, manganese and molybdenum. This gorgeous range of products is perfect for detoxifying and purifying tired skin, absorbing excess oils from pores and natural anti-bacterial agents work to assist in the prevention of acne and break outs. Alite has a range of scrubs, masks, oils, lotions and salts for the face and the body. These natural products combined with our range of spa therapies from Wai Ora Lakeside Day Spa - including massage, facials,body scrubs and beauty therapies - will leave you feeling fresh, invigorated and alive. The Alite range has been extensively trialled both internationally and in New Zealand on a range of skin types. The product has not been tested on animals. 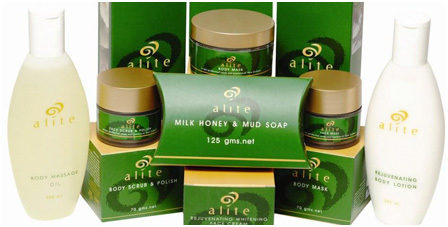 The Alite Mud Spa product range has been designed to be non-allergenic for most skin types.